Should my child wear a sportsguard often referred to as a gumshield? We believe the simple answer to this question is yes! Gumshields / sports guards help to spread the shock or impact on the teeth and spread it over a wider area thus reducing the risk of tooth fracture. It has also been shown that gumshields or sports guards reduce the risk of concussion injuries in certain sports. 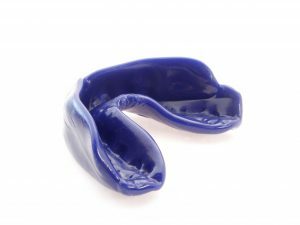 We tend to think of gumshields as an over the counter type device versus a sportsguard that is custom made. So what is it that we are trying to protect against? You can choose custom sportsguards that are made from an accurate impression taken at your dental practice or the DIY gumshield versions that are referred to as boil and bite. The DIY versions tend to end up thinnest where they should be thickest and vice versa. That said as an alternative to no gumshield then we would still say they have an important role to play. When children are growing and their mouths are changing rapidly, particularly as lots of baby teeth are being regularly lost it may be more cost effective to use the DIY type if funds are limited. Diy boil and bite gumshields do drop out of the mouth more easily. This means that they do not encourage open mouth breathing during exertion, which I have heard some users cite as a reason for not wearing them. Custom made sportsguards do fit better and will in most cases be self retentive. This means they will not drop out if your child opened their mouth. Made and fitted by a professional they will also be more comfortable / less likely to rub sensitive yong gums.This in my book = more likely to be worn. The close adaptation of a custom made gumshield also means that forces will be more readily spread over larger areas which is a key factor in minimising damage from a blow to the mouth or jaw.